With the appointment of England's first foreign football manager, Sven-Goran Ericsson, a taboo had been broken and there was less resistance to the appointment of Italian Fabio Capello in 2008. The choice was announced in December 2007, less than a month after the sacking of Steve McClaren, following England's failure to qualify for Euro 2008, and he officially started in the post on 7th January 2008. At the time of writing Capello's England have successfully cleared the first hurdle, qualification for the 2010 World Cup in South Africa. And they cleared it in some style, scoring easily the highest goal tally across all the European qualifying groups and scoring more points than any team apart from Spain's perfect ten wins. The mood of the nation currently appears to be one of cautious optimism. The only blot on the copybook, the 1-0 loss of the last but one game to Ukraine, highlighted defensive weaknesses and there does not seem to be a regular first choice attacking combination. But those points aside England look to be in pretty good shape and as the squad is largely the same as the one that McClaren failed with, the success has to be down to the manager. But who is he? 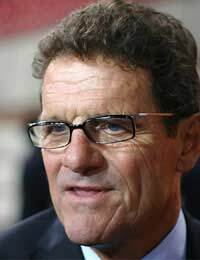 Fabio Capello enjoyed great success as a player with Roma, Juventus and AC Milan and was capped 32 times for his country. Perhaps unfortunately he regards the highlight of his player career a goal that he scored at Wembley, the only goal of the game. This was the first time that an Italian side had beaten England at home. Once his playing career was over Capello embarked on a series of successful stints as a manager of top Italian and Spanish clubs. He has won the domestic league title with every team he has managed, including AC Milan, Roma, Real Madrid and Juventus, but prior to taking the England position he had not managed an international side. This was one of the major concerns about his appointment as England manager, the other being that he did not at the time speak English. On the plus side his reputation for being a no-nonsense manager who was perfectly happy to stand up to players must have been a major draw for the FA, particularly after the apparent pandering to player power of the McClaren and Ericsson eras. Capello had a high profile disagreement with David Beckham during his time at Real Madrid, refusing to play the player when speculation about his stay with the club began to get over the top. But he did recognise the player's efforts to play his way back into the side and brought him back in time for Real Madrid to overhaul Barcelona for the title that year. Fabio Capello is the first to point out that the success of the team comes from the players themselves but also recognises the contribution of his backroom team. In the senior coaching team only goalkeeping coach Ray Clemence and Stuart Pearce, in a dual coaching role with the Under-21 side and the senior team, remain from the previous administration. The new faces that have been brought in are exclusively Italian and have all worked with Capello at more than one of his previous clubs. These include fitness coach Massimo Neri, general manager Franco Baldini, assistant coach Italo Galbiati and another goalkeeping coach, Franco Tancredi. With the England team safely at the World Cup for 2010 Capello has certainly delivered the goods so far. His contract takes him to the tournament and there is an option to extend to take in the European Championship in 2012. There are question marks over a number of areas where the team seems weak but the players seem to have responded to his management style. Roll on the World Cup.